The HUBER Micro Strainer ROTAMAT® Ro9 is installed directly in a channel or into a separate tank. The wastewater flows in through the open front end of the screen basket and through the screen bars or perforations. Solids are retained by the screen basket, whereby the separation of floating, settling and suspended solids is dependent upon the screen bar spacing or perforation size. Blinding of the screen surface generates an additional filtering effect so that solids can be retained that are smaller than the bar spacing or perforation. The machine starts to operate when a certain upstream water level is exceeded due to screen surface blinding. A robust stainless steel screw removes the screenings from the screen basket surface. Additional cleaning is achieved by wear-resistant brushes fitted to the screw flights. The screw conveyor transports the screenings through a closed and inclined pipe. Whilst the screenings are transported, the screw conveyor dewaters and compacts them without any odour annoyance prior to discharging them into the customer's container or a subsequent conveying unit. 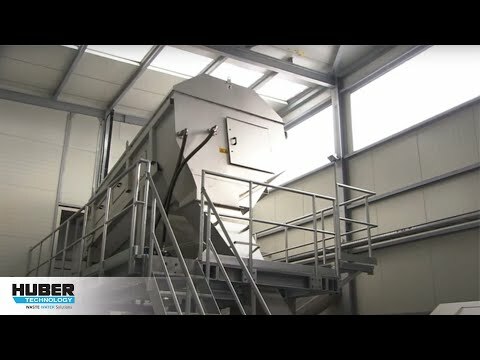 The HUBER Micro Strainer ROTAMAT® Ro9 operation is based upon a unique system that allows the combination of screening, washing, transport, compaction and dewatering in a single unit. Depending on the screen bar spacing or perforation and screen size (up to 700 mm screen basket diameter), the throughput can be individually adjusted to specific site requirements. The screen can be installed either directly into a channel or into a separate tank.